Welcome to Eventegg's Baltimore guide which is packed with up to date information about city's attractions as well with best places to dine & shop. Learning American History, or soaking in the easy atmosphere on the waterfront, everything comes easily in Baltimore, the largest city in the U.S state of Maryland, and nobody can blame you for falling for its charm. The city of Baltimore (founded in 1729) witnessed the War of 1812 from close quarters, and a lawyer Francis Scott Key penned down his feelings on the onslaught in a poem, ‘The Star-Spangled Banner’ which became America’s National Anthem. The master of literary suspense and eeriness Edgar Allan Poe hailed from Baltimore (affectionately called ‘Bawlmer’ by Baltimoreans), so did the music legends Billie Holiday, and James ‘Eubie’ Blake. Baltimore’s Inner Harbour was once the second leading port of immigration entry into America, and till date there are numerous ethnic neighborhoods existing amicably, thus giving it one of its plethora of nick names –‘the city of neighborhoods’. The cityscape and suburbia is dotted with monuments of national heritage, one of them being the Basilica of the National Shrine of the Assumption of the Blessed Virgin Mary, the first metropolitan cathedral in the United States. History, legends from the high seas, a smorgasbord of culture, and the appeal of the waterfront make Baltimore a ‘Charm City’, and deservedly earn its motto, ‘Get in on with it’. Located in central Maryland, Baltimore sits beside the Patapsco River, close to its mouth in the Chesapeake Bay. Geographically, it is perched interestingly between the Piedmont Plateau and the Atlantic Coastal Plain, which divides this independent city into ‘upper’ and ‘lower ‘Baltimore. Baltimore County surrounds ‘Charm City’, and is bordered by Anne Arundel County in the south. Baltimore/Washington International Thurgood Marshall Airport is 15 minutes away from downtown, and it is also served by Washington Dulles International Airport, and Ronald Reagan Washington National Airport in Northern Virginia. The city’s two main railway stations – Camden, and Penn – are connected to Washington D.C. Maryland Transit Administration buses ply from the airport to the city centre. How to get around in Baltimore? There is a small light rail network available. Alternately, you can avail personal taxis. Within city limits Charm City Circulator, a shuttle bus service has four routes traversing the ‘city neighbourhoods’. The service is efficient, and free of cost. There are a number of bicycle trails within Baltimore. A 2011 survey had named it the 14th most walkable cities among 50 of the largest in the Unites States. You must pay a visit to Fort McHenry National Monument and Historic Shrine to relive those days in 1812 which gave birth to the American National Anthem. The star shaped fort on the waterfront is also pleasing to the eyes. Another must see is the Washington Monument in the Mount Vernon neighbourhood, which is senior to the more recognized edifice in Washington D.C by several decades. Baltimore Harbour does not fall behind in the preservation of maritime American history. The USS Constellation, the last of the Civil War –era ships is docked here, along with the Coast Guard cutter Taney which survived the Japanese attack on Pearl Harbour on Dec 7, 1941. If the adventures of Captain Jack Sparrow have thrilled you, then you can get a taste of buccaneering on the board of ‘Fearless’, Baltimore’s own pirate ship at Fell’s Point. Yes, it goes out into the sea for a cruise as well. You can see the world’s most important collection of Matisse at the Baltimore Museum of Art. The Bromo Seltzer Arts Tower is another place where you can watch both visual and literary art on display with the option of interacting left to you. You can also get your fill of art history at the Walters Art Museum. Baltimore is a city with rolling parklands. Be it the Patterson Park, or the Druid Hill Park, or the Federal Hill Park, you are bound to feel rejuvenated with your outings. President Street Station, an important rail terminus from the times of the Civil War, appropriately houses the Civil War Museum. It had also helped many a collared person flee in the past from their destiny of being ‘12 Years a Slave’. If you are into sports, then the neighbourhood of Little Italy can satisfy your desire for a game of bocce ball. Tourists are welcome to play along the locals. The Inner Harbour region has several volleyball courts, where you are equally invited. The Inner Harbour region also hosts the National Aquarium, definitely one of the best place to observe aquamarine life in all of America. In July Baltimore is abuzz with the African-American Festival, a cultural extravaganza. October is the event of Fell’s Point Fun Festival – two days of non-stop of carnival. You can schedule your visit to coincide with either of the two, and you won’t be disappointed. The 60-years-old Enoch Pratt Free Library is the place to drop in to know why Baltimore is also nicknamed, ‘the city which reads’. You can indulge in shopping at Cross Street Market in Federal Hill, or Lexington Market near the Hippodrome Theatre. Broadway Market at Fell’s Point is also worth a visit. The Harborplace Amphitheatre hosts free performances of singers, dancers, and impresarios. You can get to hear anything from Motown and funk, to R&B and country during the weekends. In the day, street performers throng the area. The harbour region is the perfect place to dig into the famous Chesapeake cuisine. As Baltimore is a mix of many cultures, you can try out any exotic cuisine of your choice in the many neighbourhoods of the city. Charm City’s proximity to New York, Washington D.C, and Philadelphia make these places ideal getaways. Port Baltimore offers cruises to several parts of the state of Maryland; you can also sail around town in the popular water taxis. Baltimore Helicopter Services arranges charter facilities for destination on the Eastern Shore. 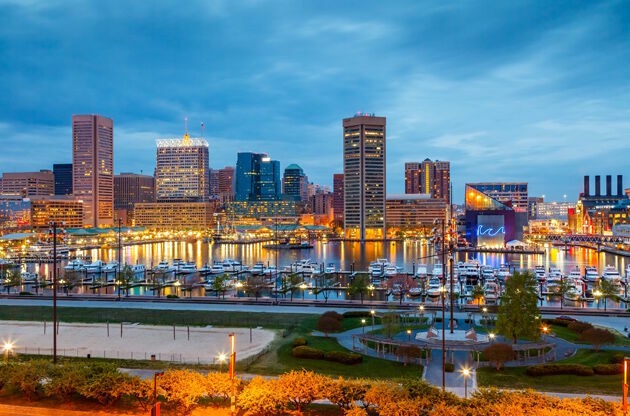 Baltimore has been getting a lot more attention from the world's event tourism scene thanks to the rapidly increasing contributions made to the high quality hotels and high tech equipped venues. Ever year Baltimore hosts a large number of international congresses, conferences, symposiums, fairs and tradeshows. When the beauty of the city and the accessible transportation is also taken into consideration, it's right to say Baltimore deserves the praise it has been getting in the recent years.